A while back I did a mod for the hypershade window to add a button for toggling the updating of the thumbnails. Turning off updates can improve performance when you are modifying complex shader networks. I've just added a version for maya 2012. The hyperShadePanel.rar on the downloads page now contains 2 new hyperShadePanel.mel versions - for 2011 & 2012 mel script (put the one you need in your local scripts folder) and 2 new bitmaps in the png format (put both of these in your local icons folder). update: added 2011 version to the rar file, as well as fixing a small autodesk created bug in the 2012 version where the width of the create tab always took up half the window when first opened (bug fix thanks to Ingo Clemens). If you downloaded in the last last 24 hours you may want to get this update. 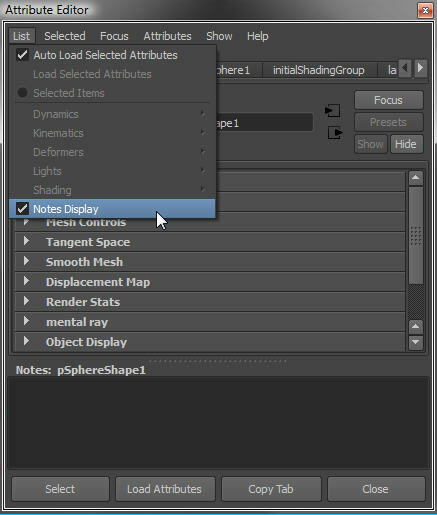 The attribute editor in Maya 2012 keeps expanding the Notes roll-out. I'd never noticed this being quite so annoying in previous versions. I'm pretty sure that previously, once I closed it by dragging the divider bar to the bottom of the window, it stayed like that until I pulled it up again. 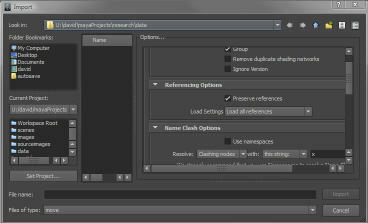 Now, in maya 2012 it seems to jump up again as soon as I deselect anything. Most of the time this is a waste of space for me. To make this even easier I thought it would be good to add a menu item to the List menu in the attribute editor. So you can turn it on and off and maya remembers your last choice between sessions. This functionality is added by modifying a copy of one of the maya installation files called showEditor.mel which can be placed in your local scripts folder to avoid messing up the maya install. You can get the mod for maya 2012 from my downloads page. I've updated the rar files on my downloads page to include maya 2012-x64 (windows) versions of Michael Comet's Pose Deformer and the Sony Pictures Reticle (aka spReticle). 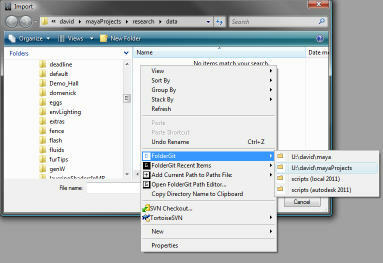 Maya 2011 lets you choose between two different "Dialog Styles" for interacting with the file system. This one, called "Maya default"
or this one called "OS native"
This is the UI you see when you do things like open or save, import or export a file. The default (called "Maya default") lets you do more than just choose a file, and some people will probably find the extra capability quite useful. But I'm not one of those people. I prefer the "OS native" style of dialog. I prefer it because it is consistent with most other applications. Its great to have the choice to use one or the other. Ever since I can remember, maya has had an annoying bug that causes materials to display incorrectly in the viewport in both "Smooth shade all" and "Textured" modes. then you may be interested in a workaround. Its not perfect, but its better than nothing.